Howdie folks! How is life treating you? I hope you are enjoying Fall days every bit as beautiful as the ones we are having here. The sun is about, the skies are blue and the temperature is mild (but not for long I hear, cold times are coming). I promised you I’d show you where I went shopping in NY. And really when talking about shopping in NY I should say S.H.O.P.P.I.N.G !!!! Holy moly this city is unbelievable when it comes to shopping (and eating, only the number of eating places outnumbers the amount of shops, I think) you could walk around for a year and not see all of them. Anyway I arrived with an empty bag and left with a full one, and a camera full of inspiration. Speaking about inspiration. Can you guess whose inspiration board this is? Yep Rachel Ashwell’s herself! I visited her SOHO Chabby Chic store. So lovely! I think this picture captures the magic nicely. The linens, chandeliers, furniture and of course fun elements like the ball gowns and ballerina slippers. An old underskirt! It was huge but I loved it. Not faraway in SOHO you’ll find ABC Home. Six stories of fabulousness in a true and beautiful SOHO cast iron building. Inside beauty everywhere. The building itself is an attraction. Look at those chippy painted columns! It is that I have already found some repurposed wood to use as a headboard, but otherwise I so would be hunting for a tree to chop down and dig out. Isn’t this to die for?! 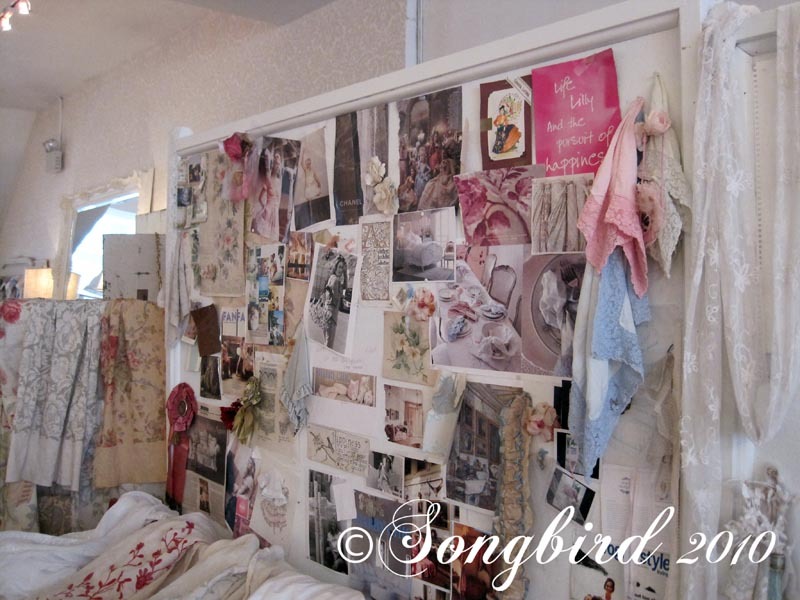 Oh and when I saw this wall in the bedroom section it brought Funky Junk Interiors to my mind. Donna if you can’t figure out what to do with palette wood next: built a wall! You all know (or might know) I am not a fan of modern furniture, but I thought this couch with all of those different fabrics was really cool. But a couch like that would kind of steal all of the attention in the living room, don’t you think? On the top floor, it was French European furniture all around. Lovely grey tones, chippy paint and lots of frilly (but stylish) details. And I think I took at least a dozen pictures of this mirror. I was totally mesmerized by it. If I can figure out how, I am totally gonna revamp a mirror like that. The collection of papers that they stuck at the back of the mirror was so totally my style. I loved ABC Home but was NOT tempted to buy anything because frankly the prices where out of this world ridiculous. Don’t believe me? Look here, a simple fabric heart. Ruffed up linen and a black stamp to be had for the mere amount of $ 80!! Yes really, we DIY girls could whip this up in five minutes flat and they want 80 of our hard earned dollars for that! Think this is just an exception? Take a good look at these lovely altered bottles. Don’t you just love them? Yep 50 dollars each! I mean come on, they are beautiful but 50 dollars! A family can eat a week on that budget (ok a small family). More inspiration to be found, this time at Anthropologie. Sometimes it was even hard to tell the store decorations from the stuff that one could buy. This lamp: decoration or sellable item? And this headboard definitely asks for a DIY version. Doily lovers unite, let’s revamp them into headboards for our beds. And my favorite by far is this book/ chandelier display. The chandelier was completely made of paper and it was gorgeous! Some very crafty person spent more than a couple of hours on that one. Anthropologie please open up a store in the Netherlands, PLEASE!! Another store I would love to transplant over here was Fish Eddy. Basically a china store, but in reality so much more. The displays are so innovative and the china itself is so pretty and often funny. I loved all of there signs everywhere. Such beautiful graphics, I took pictures of a ton of them. And I thought that the old pictures and crates and nicknacks really added something truly great to the atmosphere. I could have walked around there for hours, there was so much to see everywhere. I really wanted to fill up my suitcase with this Alice in Wonderland china, but I was afraid it wouldn’t travel very well. And of course there were the famous Fish Eddy hands too! Ok, then after my lusting after a Pottery Barn catalogue and beeatching about the fact that PB won’t let me visit their site (you can read all about that here), I wasn’t going to let the opportunity to visit a store pass me by. Beautiful Fall and Halloween displays everywhere. They sure know how to do a proper vignette over at Pottery Barn I’ll give them that. Look at these soap bottles. Nice he! Except I have exactly the same one standing on my kitchen sink as we speak, and it has been there for over a year. At PB this lovely China made soap bottle would set you back $ 22 and I got it at a Dutch discount store for no more than a few euros. Which shows me that I should stop thinking that I am at a disadvantage here in Europe without all of those American shopping opportunities. But I loved the Pottery Barn catalogue and that came home with me for sure!! Ok then and finally the holy grail for every vintage/ mixed media craftster. Here I am showing off that I found it. And it really is a lovely store, just after my crafty little heart. So many examples of lovely crafty things. My hands where itching for my glue stick and some serious glitter. Oh to work in a store like this. It is my kind of heaven. And look at this mannequin in the shop window. Vintage at its best! I bought a whole stack of Somerset/Stampington publications (like 10 or so! I know, I am crazy) and with all of that inspiration both in the magazines and from visiting these wonderful stores in NY, I can see many happy crafting hours in my future. Now if I only could find the time…. So tell me, which store did you like best? Did you see something here that made your heart stop and think “I could do that” ? Do you think I used my time in NYC well? Let’s talk people. And then that will be the last of my going on about my trip to the States and some ‘normal’ home decor/crafty blogging will resume. Okay, first of all how do you say Holy Moly in Dutch :)? I love that you have picked up all of our slang so beautifully. Secondly, you did so many things I would have LOVED to have done with you :(! Tinsel Trading Company was at the top of my list and I knew we would just love it! And lastly, I want to hear if you tasted any foods that were new and that you liked! My mom's side of the family is Dutch and settled in Holland Michigan. There is a running joke in my family that the Dutch have "Dutch Mouth" meaning they like their food very, very bland. Is that true? I am in deep, serious, puffy-hearted love with that skirt chandelier. I'm totally going to try DIYing a smaller version for my dining room. Thanks for the inspiration! Beautiful! Thank you so much for all of the pictures. I really need to get to the city more often. NYC is about a 5 hour drive for me. If you can make it from the Netherlands, I have no excuse! I adore Rachel Ashwell's hoop skirt chandy. And, holy hardware at Tinsel Trading. I can't believe that heart was $80!!! I make and sell them, lavender filled mind you, for $10 and feel guilty. I enjoy your tour through the city! I really enjoyed your pictures of your shopping trip. Wait, did you buy anything? I know I would of just window shopped, those prices are down right over priced! The rent must be high over in New York. So thanks for taking us through your adventure, your pictures were lovely and inspiring for future DIY projects. Oh my goodness, so many lovely things!!! Looks like you had a wonderful trip. Thank you for sharing the inspiration. OH OH HAHA, ik zie die zeep dispenser staan!! JAJA kun je nagaan wat PB erop verdiend toch?? Zag ze ook bij de A….. voor een song and dance lol. I'll have to keep that tinsel trading store in mind for when I go next! Wow, You really found some great shops there! I too love the underskirt chandy. I never get to the city, and for me it's also only a 5 hour drive. Maybe I should reconsider that now, knowing how many cool stores they have. Glad you had fun and that your foot got better in time to shop! Merci de cette petite visite de mes boutiques préférées de cette ville. You hit all my favorites! I've long been a fan of Fishs Eddy and ABC Home. But you're right – I've never actually bought anything at ABC – just looked. Too expensive! The one place I haven't been to yet is Tinsel Trading and I plan to make a visit there this fall. haha your photos are right… ABC is definitely gorgeous, but totally unaffordable! But I really love that mirror you posted! I live an hour from the city (and for two years in it! ), and I never managed to stop into the Rachel Ashwell store! What was I thinking. Definitely going to go sometime soon. And thanks for posting about Tinsel Trading. Never heard of it, but that's going to be another place I'm going to visit soon! Looks like you had a lot of fun! Even though I enjoyed looking at your shopping photos, all the stores are interesting with nice vignettes, my favorite is Tinsel Trading. A crafters dream come true. Tjééééétje!!!! Vind het allemaal geweldig! Maar Rachel en de craftstore springen er voor mij wel uit hoor! Alhoewel… Anthropologie is natuurlijk ook wel heel erg gaaf! Hmmm… ik kies denk ik toch voor de crafstore, geloof dat dat een hemel op aarde is! I've been to Tinsel Trading and found it to be absolutely wonderful. Next time, I'll visit Rachel Ashwell. Oh, and I love that mirror, too! die spiegel is wel heel erg mooi…. en anthro mag wat mij betreft wel in amsterdam komen… ik kom af en toe wel langs… wat een heerlijkheid allemaal. maar die Hobby winkel… zij hebben mijn kast.. zo'n kast wil ik ook nog.. maar degene die ik nog tegengekomen ben, zijn de laatjes van te klein! je hebt het wel naar je zin gehad geloof ik … wanneer ga je weer? Someday I'll get to go to Tinsel Trading Co…. someday! Oh wow! I agree that mirror is beautiful. Those price tags on the other hand are not! I find when I peruse stores and find stuff like that heart (the stuff you can make yourself) I have a hard time finding credibility in other stuff they sell. If they're asking that much for one item, how overpriced is everything else? NYC looks fabulous. I'm not sure if I'll ever get there, but it's nice to visit through your eyes. oooh fab pics. I would love to see fish eddy, pottery barn and that craft store ! I'm going to the states next year and cannot wait to visit all the cupcake, vintage, bake & craft stores I can find LOL.